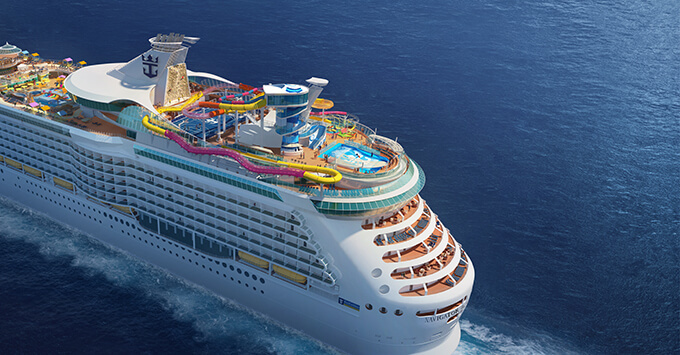 (10 a.m. EDT) -- Royal Caribbean's Navigator of the Seas will unveil two new-to-the-line water slides, as well as a Caribbean-inspired pool deck, blow dry bar, and new dining and beverage venues when it emerges from a $115 million "Royal Amplified" refurbishment in February 2019. "Each Royal Caribbean ship brings a new adventure uniquely designed to deliver on our guests' preferences from A to Z," said Michael Bayley, president and CEO of Royal Caribbean International. "After launching our Royal Amplified modernization program with Independence of the Seas and then redefining short getaways with Mariner of the Seas, we are challenging ourselves to take it to the next level. Every detail matters, and we've mapped out an unmatched combination of innovative features and experiences for this top-to-bottom transformation of Navigator of the Seas." Navigator of the Seas will be the third ship in the fleet to receive the line's Royal Amplified treatment. The $1 billion modernization program spans 10 ships over four years. Below is a breakdown of what's in store. The entire top deck of Navigator of the Seas will be transformed during the refurb, from front to back, welcoming the addition of the Perfect Storm water park. However, Perfect Storm on Navigator will be unlike any other across the fleet, with two new-to-the-line waterslide experiences. 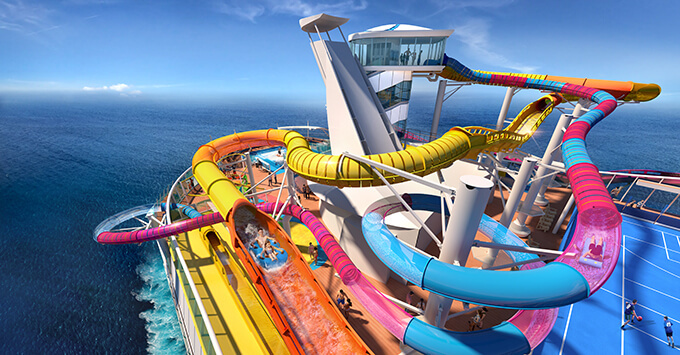 The Blaster will be Royal Caribbean's first-ever aqua coaster. Cruisers will hop on a two-person raft that takes them through more than 800 feet of hills, drops and straightaways, including a section that extends out over the side of the ship. The second waterslide, Riptide, will be the industry's only headfirst mat racer. For those looking for a more sedate top-deck experience, the pool deck will be reimagined as a Caribbean-inspired "poolscape." The pool will be enlarged and a Splash Pad will be added for toddlers. Several restaurants and bars will be added to Navigator of the Seas during the refurb, both in the ship's Royal Promenade and on the top deck. In the Royal Promenade, cruisers will find the Bamboo Room, first introduced on Mariner of the Seas. This Polynesian-themed lounge serves up a selection of cocktails. Nearby will be the Playmakers Sports Bar & Arcade, featuring 50 big-screen TVs for catching live sports, tabletop games, trivia, tournaments and a new Owner's Box VIP room. On the menu is a selection of classic bar fare and ice-cold beer. Royal Caribbean will add the popular Jamie's Italian restaurant, as well as Hooked Seafood; Chops Grille also will get a makeover. For those in need of quick caffeine fix, a Starbucks will be rolled out as well. Cruisers hanging out by the pool will be able to enjoy the all-new The Lime and Coconut, a two-level bar with extended hours, live music and a "rooftop" deck. When hunger strikes, pool goers can grab a bite to eat at El Loco Fresh, a Mexican eatery that debuted on Symphony of the Seas. Also new, is a grab-and-go Johnny Rockets Express. 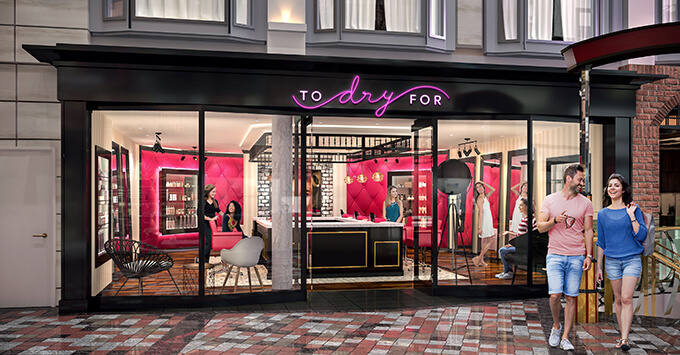 The industry's first blow dry bar at sea will be located in the Royal Promenade. The venue will offer blowouts, hairstyling and polish changes, along with a selection of wines and champagne. In addition to the top-deck activities, Navigator of the Seas will boast a slew of new fun-for-everyone choices including glow-in-the-dark laser tag with Battle for Planet Z (located in Studio B) and the Royal Escape Room: The Observatorium. Kids areas also will be redesigned. Adventure Ocean will sport open, free spaces, while the teen-only Living Room will be upgraded with a new "hidden" entrance and outdoor deck. When Navigator of the Seas arrives in Miami after its refurb in February, it will sail a series of five- and nine-night Caribbean itineraries, before transitioning to three-night weekend and four-night weekday sailings to the Bahamas starting in May 2019. It will be the first ship to experience the "Perfect Day at CocoCay" at the line's newly revitalized private Bahamian island.